The authors outline the skills needed and common issues in case management practice across a range of people with different disabilities at different stages of their life. 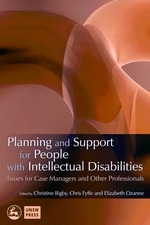 Emphasising the importance of taking a rights-based approach to supporting people with learning disabilities, the authors argue that effective case management needs to be individualised and carried out in partnership with the individual and their family in order to draw up a lifestyle plan that meets their many needs, including employment, education, vocational training, therapy and behaviour support. The book includes chapters on inter-agency and cross-sector negotiation and collaboration, balancing rights and protection, listening to individuals and families, communication, optimising health outcomes, approaches to behaviour support, ethical decision-making and reflective supervision, and the text is complemented by case studies throughout. An essential reference for practitioners, the book is also an invaluable guide for policy makers, researchers and students, nurses, carers, and people with intellectual disabilities and their families. Foreword, Jim Mansell. Introduction: Contexts, Structures and Processes of Case Management, Christine Bigby, La Trobe University, Chris Fyffe, Consultant, Australia, and Elizabeth Ozanne, University of Melbourne. 1.Case Management with People with Intellectual Disabilities: Purpose, Tensions and Challenges, Christine Bigby, La Trobe University. 2.Understanding Intellectual Disabilities, Chris Fyffe, Consultant, Australia. 3. Balancing Rights, Risk and Protection of Adults, David Green, La Trobe University, and David Sykes, the Victorian Office of the Public Advocate. 4.Walk a Day in My Shoes, Lesley Gough, RMIT University, Australia. 5.Case Management in a Rights-Based Environment: Structure, Context and Roles, Tim Stainton, University of British Columbia School of Social Work. 6.Working with Other Organisations and Other Service Sectors, Estelle Fyffe, Annecto - The People Network, Victoria. 7.Working to Empower Families: Perspectives of Care Managers, Gordon Grant, the Centre for Health and Social Care Research, Sheffield Hallam University, UK, and Paul Ramcharan, RMIT University, Bandoora, Victoria. 8.A Life Managed or a Life Lived? : A Parental View on Case Management, Marie Knox, Queensland University of Technology, Brisbane. 9.Taking It Personally: Challenging Poor and Abusive Care Management Practice, Margaret Flynn, Sheffield University, UK, and Peter Flynn, Manchester, UK. 10.Be There For Me: Case Management in My Life, Colin Hiscoe, Reinforce, Victoria, with Kelley Johnson, RMIT University, Melbourne. 11.Working Things Out Together: A Collaborative Approach to Supporting Parents with Intellectual Disabilities, Margaret Spencer and Gwynnyth Llewellyn, Sydney University. 12.Intellctual Disability and the Complexity of Challenging Behaviour and Mental Illness: Some Case Management Suggestions, Gary LaVigna and Thomas Willis, Institute for Applied Behaviour Analysis. 13.The Importance of Friendships for Young People with Intellectual Disabilities, Brenda Burgen and Christine Bigby, La Trobe University. 14.Issues of Middle Age and Beyond for People with Intellectual Disabilities and Their Families, Christine Bigby, La Trobe University. 15.The Role of the Case Manager in Supporting Communication, Susan Balandin, University of Sydney. 16.Accessing Quality Healthcare, Philip Graves, Monash Medical Centre, Victoria. 17.Supporting Children and Their Families, Susanna Gavidia-Payne, RMIT University, Melbourne. 19.Review of Evaluative Research on Case Management for People with Intellectual Disabilities, Janet Robertson and Eric Emerson, Lancaster University, UK. Notes. Subject index. Author index.